Interview with Rod Steele and Kim Steele conducted July 2011. For as long as anyone in Larry Steele's family could remember, he was a performer - a destiny that was carved out at an early age. "He won a Star Search contest in the 5th grade, in Longmont," said his brother Rod. "He actually taught himself how to play the guitar, and then there was no stopping him." Born in Englewood in 1937, to Lester and Ruth Steele, music was a way to entertain the family in their Castle Rock home, where Larry was the oldest of seven boys. "Mom had a beautiful voice," Rod Steele said. After Larry graduated from Castle Rock High School, he got married, then moved to New Mexico, to work with a then-unknown singer, Glen Campbell. "Glen was from Albuquerque, and so he started playing with him. Then he got drafted." After serving in the U.S. Navy for four years, Steele picked up where he left off and came back to Colorado, where he started jamming in bi-racial rhythm and blues bands. "Then one day John Capps from K-ARK records in Nashville shows up at one of his shows, and asks if he wanted to do a demo," Rod Steele said. Steele was writing his own r&amp;b-tinged songs at the time, so he pitched several to the label, who decided to groom him as its next superstar. 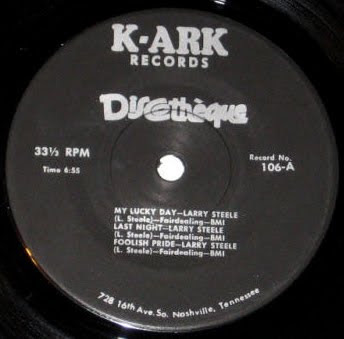 Released on the K-ARK Discoteque label (106), his first recording was an EP of six songs. 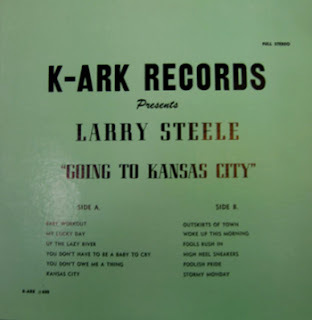 Side One:"My Lucky Day" "Last Night" "Foolish Pride"
Side Two: "Up The Lazy River""Stormy Weather" "Birth of the Blues"
Throughout the late 1960s Steele would go on to release several singles. In a risky move, he then decided to switch to country music. K-ARK proceeded to get the word out about their new country music discovery, with the release of an LP, and a series of articles in many magazines, including Billboard. A week later, the trade magazine ran a picture of Steele. K-ARK 648 – "Baby Workout" / "My Lucky Day"
K-ARK 659 – "Ramblin’ Man" / "I Ain’t Crying Mister"
"I Ain't Crying Mister" peaked at #43 on the Billboard Hot Country singles chart on January 22, 1966. K-ARK 802 – "Hard Times" / "Apple or a Pair"
K-ARK 837 – "Hello Satan" / "Tall, Down on my Knees"
Listen to a sample of "Three Men on a Mountain." 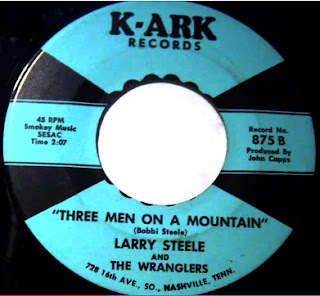 K-ARK 875 – Larry Steele and the Wranglers – "How About it Young Lady" / "Three Men on a Mountain" K-ARK 893 – Larry Steele and the Wranglers – "Yesteryear’s Man" / "Plain Simple Life"
Sometime in 1966 Steele aligned himself with the Hilltop label, the Pickwick country project. According to the April 2, 1966 issue of Billboard, Larry Steele, along with Johnny Paycheck, and Lloyd Green were all signed with the company. 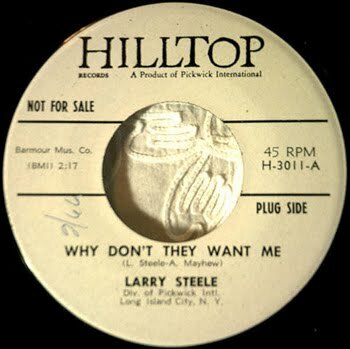 The story mentioned an album project, but it appears Steele only released three singles with the label: "Why Don’t They Want Me" / "Little Jimmy" (Hilltop 3011), "Little Brenda" / "Daylight Losing Time" (3012), and "Little Folks" / "Little Jimmy" (3014). "He had always been kinda hillbilly," said Rod Steele. "It didn’t matter what he played, he just played it - he just loved music. Larry was ahead of his time. When he went into country, people were just starting to hear that rhythm that you hear now in country. But interestingly enough, he really didn't consider himself a country singer." In 1969 Rod Steele joined his bother, when Larry Steele was asked to perform in Vietnam. "I played drums for him. We did that for about three months, playing for the troops." After his contract with K-ARK expired, he came back home to Fountain, where he decided to stay put in Southern Colorado. "He had nine kids at this time, and I think he wanted to find something more stable," said Rod Steele. "He was playing at the Caravan Club in Pueblo, and Bob Sloan, who was the owner, told him that he wanted to get out of the nightclub business. He asked Larry if he wanted to buy the club. So he did." 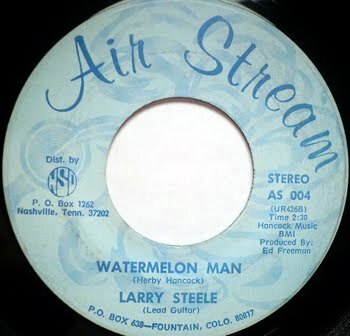 Larry Steele didn't have any experience running a nightclub, but he and his wife ran the bar from 1971-1974. "He really didn't make any money out of it, and with nine kids to feed, he needed to find something else to do." In 1972 he caught a big break by opening for Buck Owens at Red Rocks. 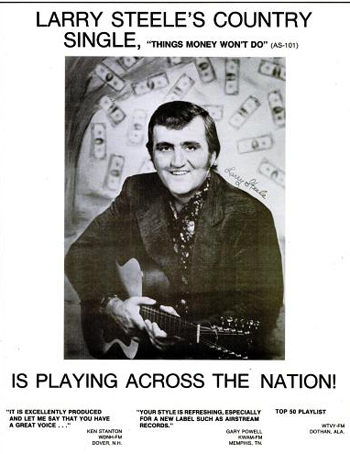 He also signed with the Johnny Seeley record label, Airstream, based out of Fountain. 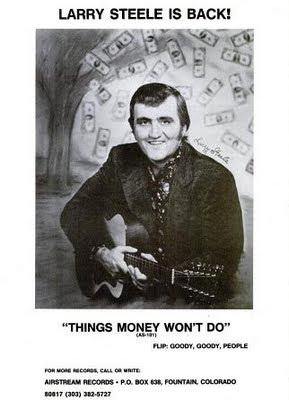 Steele would go on to release "Things Money Won't Do" / "Goody, Goody, People" (Airstream 101), and "Little Wine, Little Gin" / "Hold On" (Airstream 003), which received a favorable write-up in the June 8, 1974 issue of Billboard, as a "recommended" country song. Seeley's intense promotion of Steele resulted in numerous write-ups on the artist. That same year, as part of a full page feature on Colorado record labels, Billboard highlighted Airstream, and its star client, Steele. 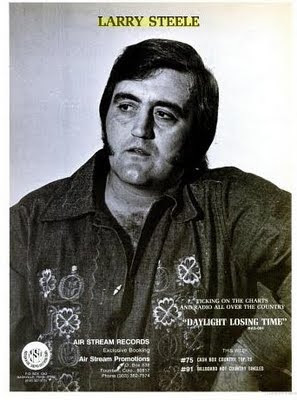 On Dec. 7, 1974, his third single "Daylight Losing Time" (Airstream 004) hit the Billboard Hot Country Charts, peaking at #90. The single stayed on the charts for five weeks. In 1975 tragedy would strike when Larry Steele was involved in a motorcycle collision with a truck. "The doctors told us that he would never walk again - but he proved them wrong," said his daughter, Kim. Larry Steele continued to race stock cars, and take part in rodeo competitions, and he never gave up on his music. "My dad was always playing his guitar and writing on a tablet," Kim Steele said. "We were always dancing and singing, and the record player was always going." In 1977 he packed up his family and moved to Tennessee, where he secured a position writing songs for Acuff-Rose Publishing. "You had to live within a 30 mile radius of Nashville to work for them," said Kim Steele. "We all moved, but that's when mom and dad went through their divorce." Larry Steele would later remarry, and move to Alba, Missouri, in 1998. His knees had always given him some trouble, as a result of the motorcycle accident, but it never kept him from performing - until a show in Florida, opening for Mark Wills. "He was doing this concert, and the pain was too much. He had already said he couldn't do anymore operations, so gangrene set in, and he lost his leg," said Rod Steele. The next few months are a blur for the family. Nobody saw any signs of depression, or suicidal thoughts. 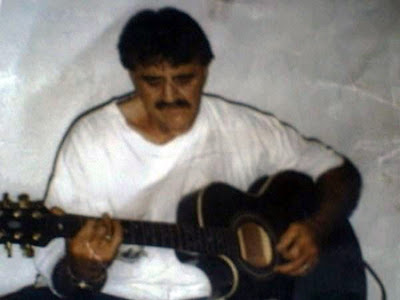 Larry Steele continued to write music, and keep up with his family. "I got the call that my dad shot himself," said Kim Steele. "I got in the car and drove straight from Colorado to Missouri. "I was able to get there before he died." 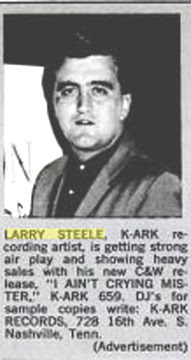 Larry Steele passed away March 6, 2003. He was 65 years old. "I still don't know why he did it. There was just something inside of him. I don't know," said Rod Steele. "I think it took a toll on him." "The night he shot himself, on the back of his will, he was writing a song," said Kim Steele. "You know, Larry really didn’t want to be a star, but he could have been one," said Rod Steele. "He chose not to, nobody knows why." Larry Steele is buried in Greenlawn Cemetery, in Berthoud.